This isn’t a shocker, but according to an article in the Wall Street Journal (which has been reprinted all over the place, including the San Francisco Chronicle), Borders plans to close another 200 of its Waldenbooks stores, leaving a paltry 130 remaining in the chain. Despite what the article says, it’s unlikely even those are long for this world. In an era where the long tail of content is well-served online, Borders and Barnes & Noble have survived by positioning themselves as cultural and social gathering spaces. Plus, the stores are big, so they can carry a lot of titles. Waldenbooks and B. Dalton–who B&N is closing up at the same time–have no such luck. These tiny stores were always meant to bring a representative selection of literature to shopping malls and small towns, and like record stores before them, there’s just no need anymore. It’s still a little sad, since I have plenty of fond memories of shopping at the Waldenbooks in my local mall when I was young. Of course, it’s a shame that the smaller Waldenbooks stores are biting the dust, but I think its soon-to-be demise has every bit to do with Borders’ business practices as it does the economy. No wonder Borders is continuing to experience losses while B&N gains the upper hand. Customer service can be better at a smaller book store, like the late Waldenbooks in the 900 North Michigan mall. But, frankly, for browsing, I like the big Borders and Barnes & Noble stores. Sometimes, I don’t always know exactly what I am looking for, and just want to browse. The bigger selections at the big bookstores makes browsing more pleasurable. And, if you can grab a cup of coffee or snack while browsing, like in the big stores, it is even better. Sometimes bigger is better. Waldenbooks has pretty much bit the dust already in my area. The one here at the Hudson Valley Mall in Kingston closed 3 or 4 years ago, Poughkeepsie around the same time. And the ones that didn’t close were switched over to the Borders Express format. No! They can’t close the Alpena one! Neither my town, nor Sheboygan, have a B&N or Borders and aren’t getting any in the forseeable future. My town does have a Book World franchises downtown (Sheboygan doesn’t), but I wonder how well those fare? They’re the same small size as a mall-based bookstore, and offer the same customer service. Probably the fact that most (all?) Book Worlds are NOT in a shopping center proper, may be part of why they’re still around. I see both mine and the Sheboygan stores amongst the 200 to be shut. Hardly anyone is ever in either store when I go by them, and I swear Sheboygan’s is the oldest (as in, un-renovated) unit in the remaining store lineup. Of course, I just wound up buying a book on Adobe Dreamweaver (a WYSIWYG Website designer) at that very store. I swear, they were more than happy to see me there, hawking their Borders card at me from the get go. Doubt it’ll get much use though….I have no Borders within 60 miles from me. The closest is in Milwaukee, and downtown Milwaukee at that! @Matt from WI, Books and music are low margin items, and stores need volume on these to make a decent profit, esp. if they’re paying mall rents. Wal-Mart has hurt specialty retail in these areas by pushing popular titles at very low prices (sometimes selling versions specially edited for them), while Amazon has cut into the trade that has broader interests for books, while the internet has captured other media through downloads. Walden stores seem poorly sized to compete in this environment. B Dalton stores often run bigger. I would guess that the more profitable ones will be rebranded as some version of B&N. Even w/o the recession, these stores would be very much on their way out. Wal-Mart probably has squeezed them in small markets, while big boxes have done it in medium to large markets. Very true. Even without the recessionary period we’re in, just a few short years back, low-margin/high rent mall chains like Waldens and FYE were closing left and right because Wal-mart and online shops just do it all better, and cheaper. Walmart: top titles dirt cheap / Online specialty stores: breadth of selection without the absurd overhead and rent of a mall. I need to add to my original post too….. I went to look at the PDF of the proposed store closings. I needed to pick up the lower half of my jaw from dropping on the floor. I am VERY surprised the stores in my area are NOT closing. The three that are listed (Green Bay, Wausau and Greendale (Milwaukee suburb) ) all are in markets that have B&N and / or Borders boxes nearby. Maybe not having said box stores in Fond Du Lac and Sheboygan are actually helping to keep our Waldens alive. @Rich, Wal-Mart is pushing an awful lot of the stores I love/loved out of business, and I refuse to shop there because of it. I don’t shop online because I like to be able to view my merchandise in person, and I generally shop impulsively anyway. I still buy CDs (at CD stores, not Wal-Mart!!) and rip them to my computer rather than iTunes because the price is about the same, and I have the backup if my computer goes south, and I still read the literature in the jacket. The internet is where I go for news and some other forms of entertainment, but it has not taken over my life, like it has with some people. It’s a shame that we’re eventually going to see the demise of shopping as we once knew it. The jobs lost, the social experience, the empty buildings and wasted space… It’s sad just to think about. @Matt from WI, I knew Fox River Mall’s store had closed (which I was a bit surprised to discover earlier this year), but I shopped at the Bay Park Square location less than a month ago! I guess it just goes to show how in the retail world, things can come and go in an instant. It looks like the closing list includes both of the locations from my past: Bluefield, WV (where my family shopped who knows how many times in the 1980s and 1990s), and Morgantown, WV (where the Waldenbooks was one of the few things that kept me reasonably sane in college, along with the FYE next door.) I’ll be sorry to see them go. Borders and B&N are fine for what they are, but…they’re not very often in malls. I intended to get images today (the mall, not just Waldens), but something came up and I couldn’t make it out. You’re in for a treat with that store Andrew. Once this round of closings is done, and we’re left with 130-some stores, the location at Memorial Mall will be one of the ‘only’ ones left still retaining its early 1970s prototype. I know of no others that retained the look that this store has. When K-mart took Waldens over in 1984, the first thing they did was roll out a chain-wide program that entailed the remodeling and expansion of most profitable stores, or stores that had just renewed their lease. In doing that, many locations that had the look that this store in Memorial Mall had, were all but erased. B.Daltons (whose nearest locations to me included Fox River Mall (1984-1994), Northridge Mall (mid-1980s-1996), and Edgewater Plaza (1984-1996) ) started shuttering stores as far back as 1988-1990, shortly after being bought up by B&N back in 1987. Waldens has been slower to respond to the trend, but they’ve really been disappearing the last 10 years, again because of all the reasons cited in above posts. Another note in the histories of these mall chains. Both jumped on the ‘computer’ bandwagon in the mid 1980s. Waldens with WaldenSoftware (became Babbages very shortly thereafter) and B Dalton’s with Software Etc. Ironically, and to add to the maze of confusion, both those chains are now under what is known as GameStop, which was started by Barnes & Noble back in the early 1990s (one of their first stores being at the Mall of America), to cater specifically to console gaming, apart from Software Ect, which catered more towards computer software and peripherals. My local Waldenbooks closed in late 2006 IIRC. It remained vacant until around 2008, when it became The Shoe Dept. I noticed significant declines in the Huntsville Waldenbooks locations before they closed. In the old Parkway City Mall, the selection and number of shelves were downsized a year or two before it closed. At Madison Square Mall, I noticed that the selection just didn’t seem to be what it once was. You’d think this type of store would try to stuff more titles into their store to make browsing more interesting. It got to the point that there was no reason to go in there. The one at Madison Square has morphed into a bookstore that sells discounted books. The sign changed and the selection changed. Otherwise, it looks like the same store. Competing with a larger store by cutting selection results in death. In other malls, Walden has expanded into a double-width store to have a much larger selection, keeping their store viable and interesting. Back when Walden had one of these small stores in every mall, there weren’t many other stores to choose from, and malls were known as places to shop for books, music, and clothes. Now clothes is about it except for the malls that have picked up a Books-A-Million or Barnes and Noble as an anchor. The only small book stores I see around these days are the independents (e.g. Mendham Books, Bookends in Ridgewood). Here in NJ, they do very well because of their extensive author events and signings…many of which are better than Borders or B&N! If they can’t book those events (e.g. Atlantic Books, Pier Village-Long Branch), they close. Here’s one for you: Meridian Mall in Lansing (okay, Okemos) has Schuler Books, an *independent big box* bookstore! Even in their heyday, Walden wasn’t a very good book store. B Dalton was a little more competitive with the chains of old like Krochs & Brentano (which had a wonderful flagship and branches of various sizes) and Doubleday. They took over several department store book departments with varying degrees of success. I’m surprised that Walden in particular, survived the superstore era as long as it did. The phaseout is clearly coming. The Union Station B. Dalton in DC, which had a high volume location near the Metro and the busiest part of the complex’s mall recently was rebranded as a B&N. @Rich, Brentanos were/are Waldenbooks, not B. Dalton. But their stores were 5000 – 10,000 sq.ft which is large for a “small format” inline mall store. The inline spaces pay up to 10X what the big boxes or junior anchors pay in common area maintenance. Frankly, reviewing the numbers on a daily basis, I don’t see how ANY inline mall stores survive unless they are dealing in high margin goods. @Rich, In the Chicago area, Carl Kroch owned the name Brentano’s. Therefore, the upscale Waldenbooks division was called Coopersmith in the Chicago market. The Waldenbooks store in the 900 North Michigan mall started life as a Coopersmith but was converted downmarket to a Waldenbooks. B. Dalton had two upscale divisions: Scribner’s and Doubleday both of which B&N purchased in the early nineties. You are correct about the Kroch’s downtown being an amazing store. But their suburban stores were crap. At least half the square footage was taken up with greeting cards, party supplies and knick-knacks. They probably did that because the profit margin is much higher on these items and they help offset the high rent in malls. One advantage of Waldenbooks is that they have comic sections and B. Dalton doesn’t. Every Waldenbooks I’ve been to has been nice. Even the really tiny Alpena one. It’s interesting you posted this. 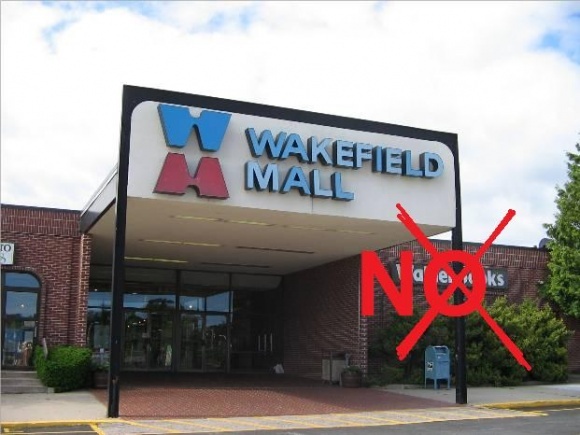 On masslive.com (website for the Springfield, MA Republican newspaper) there was an article about the Waldenbooks closing at Eastfield Mall – leaving the city with absolutely no new-book retailers within its entire city limits. Granted there are both Borders and Barnes and Noble just up the road to the north in Holyoke. But for a city of 135,000 people not to have one new book retailer in its entire city limits is pretty remarkable. I was very surprised at two that were NOT closing in my area. One at Town Center at Cobb is hanging on despite having both a Borders and Barnes & Noble in the very near vicinity. This one is a larger than usual store in a part of the mall that also once had Cole’s and B. Dalton. Another that really surprised me was the Blue Ridge Mall location I covered on a previous post…that mall is seriously dying and I can only guess very attractive lease terms is why they stay. I did manage to see a Borders Express at Haywood, but the photo did not turn out. I have photographed quite a few since I tend to be relatively forward thinking when it comes to store disappearing acts. I still see a need for them since it gives people something to do in the mall besides shop for clothes. I have spent some time in one in a particular mall location that is closing, but I kind of expected it considering that area is having a bit of trouble holding onto retail. I remember many a lazy weekend afternoon spent at the mall as a child. Mom would do some shopping and dad would take my brother and I in B. Dalton while he browsed to science fiction section. It felt like forever back then. One of the joys of my childhood was going to Tanglewood Mall on a Saturday afternoon and checking out what was new at Waldenbooks and B. Dalton Bookseller. It’s hard to remember in a post-superstore and internet world how good these stores were, but they actually were decent stores with good selections in their heyday. They were at least as good as a typical Barnes & Noble and Borders, just smaller and lacking the chairs and coffee. IMO what killed them was the shifting of corporate focus by their parent companies. After Barnes & Noble and Borders took of in the ’90s, both B. Dalton and Waldenbooks became de-facto outlets for their corporate families and started filling the fronts of their stores with worthless bargain book sections: poorly conceived clearance aisles filled with low quality books that should never have been published in the first place. The over-abundance of loss leaders shrunk the traditional book selections to a shadow of their former selves and ruined the two chains’ reputations as sources for quality books. Even though Barnes & Noble corporate eventually saw the light and integrated the Barnes & Noble search and order capabilities into their B.Dalton mall stores, Borders corporate steadfastly refused to bring Waldenbooks in line with Borders search and order capabilities until Waldenbooks got so small they couldn’t support their own system. t doesn’t take a retail genius to figure out that the companies were de-emphasizing the mall stores in favor of a larger, more profitable format and that the reduced selection of a modern Waldenbooks and B.Dalton would eventually make they easy to dispose of if the mall business never recovered (and it hasn’t so far). It’s sad to think of how many small and medium sized cities will now have no new general-interest bookstore thanks to B. Dalton and Waldenbooks’ closures. Danville, Va. and Bluefield, W.Va. immediately come to mind: somewhat isolated cities that don’t have enough college-educated customers to be considered for a book superstore but yet have enough population to support one. Cities like these will be solely at the mercy of Walmart and the like, which only stock books they figure will sell to a mainstream audience and little else. This is an embarrassing and depressing situation. Why should people in typically sized American cites have to travel 60 miles or more just to buy a non-New York Times bestseller book in person? I just hope that a company like Books-A-Million will step up and bring some essential choice and selection back to these towns. People who are passionate about reading already have a place for deep selection. It’s called Amazon.com, and the two big box book chains also have online equivalents. Most people who are already avid readers know about such places and stopped going to mall-based stores years ago. That’s what I’ve been noticing anyways. Even so, you said it best. For far-flung cities with no other options, this will hurt. Same thing already happened with the music/movie specialty mall stores for towns that don’t have a Best Buy in their area. For any chains…be them mom-n-pop entrepreneurship (this is how all chains got their start, after all) to fire up and serve a niche that is otherwise under served or not served at all in some markets, or pre-existing ones (Books-a-Million, Half-Price Books….though the latter is more a ‘pre-owned’ type of place). If they’re going to have any chance of making headway, mall REITs (not just the enclosed malls…..also strip centers, lifestyle centers, etc) need to learn that perhaps their time of pocketing big buck profits is up, and to start lowering their overhead to allow for new business opportunities to blossom. It’s the absolute only way new blood can come in and serve the marketplace. @Steven Swain, You are of course entitled to your opinion but those “poorly conceived clearance aisles filled with low quality books that should never have been published in the first place” kept many a mall bookstore in business well past the expiration date. Here’s why: once the big box superstores began to proliferate and online ordering made an infinite number of titles available, mall stores saw the serious readers being siphoned away. So who was left? Basically the mall’s foot traffic. And one way to draw them in was to beef up the high-margin bargain book sections. They weren’t all trash either. B&N has their own publishing division and they produced a number of nice quality books, including a line of hardcover classics. Added to that were the remainders. Last year’s hardcovers by Danielle Steel, Stephen King and Tom Clancy always sold well. But you (and Matt) are correct when you say that this will really affect the small rural markets. Presque Isle ME, Mt. Vernon IL and Rock Springs WY will really feel the pinch once their B. Dalton stores close in January. Of course, they can always order online. But it’s sad to think that whole generations of kids will never know the joy of browsing a bookstore while Mom shops for clothes. Also, too, many towns see their bookstore as a reflection of their community, even though they know that B. Dalton and Waldenbooks are corporate and not locally-owned. There’s just something about a bookstore. @Nick Archer, You are so completely right about the significance of micropolitan areas losing the last of their local book and music stores, even if they are a chain. As for Mount Vernon, IL, while I was doing an unsuccessful search for a national list of FYE store closures(not that unusual for a search, since I did one about 1-2 years ago when Hollywood Video/Movie Gallery was closing stores while in bankruptcy, and was rewarded by finding a huge nationwide list of closures), I did feel sad hearing Times Square Mall in Mount Vernon was losing an FYE in addition to B. Dalton, as someone who has spent at least a little time traveling to almost all parts of Illinois throughout my life. Now that I think about it, it’s pretty sad I never got to the Concord Mall Waldenbooks in Elkhart, due to the fact I heard from a source(plus confirming on Concord’s website) it was one of the few Waldenbooks that had the old school 70s look. What other Waldenbooks have the 70s look left, besides the one in Sheboygan’s Memorial Mall? I just checked and Wakefield Mall is not on the closing list. That is good since this seems to be one of the rare healthy tiny malls. I know of one mall probably smaller than this in my state, but it only has 2/15 stores operational. I was a huge fan of these stores as a kid. I too had the experience of my mom dumping me in them for hours as she shopped in the mall. I would often peruse the Film & TV section and make lists of books I would save up for (back when you ONLY paid full retail for books, unless you happened to find it used somewhere, but when I was a kid the only used book stores around were all in Boston) and/or put on my Christmas list. I remember stopping at the Wakefield, RI store in the Mall when we would spend our Summers in Naragansett, RI. We’d hit up the mall and Ocean State Job lot a few times during the Summer and I would stock up on reading material (there were also two comic shops down there, one in Wakefield, which I think is now a used book store, and one in Naragansett. Between those and the flea market in Charlestown I’d stock up on enough books, comics and magazines to last me through X-Mas). I remember the customer service at the Medford, MA store (in the Meadow Glenn Mall) was great. They special ordered Sci-Fi and horror books for me frequently. One of the oddest experiences of my childhood took place in that store. I was browsing the Sci-Fi books (trying to fill in the gaps in my “Wild Cards” series) sometime around 1990. The Sci-Fi section was always in the back of the store. I heard some weird moaning coming out of the back room so I looked in and one of the guys that worked there had fallen off a ladder and cracked his head open and was bleeding on the ground. I went and told the lady behind the counter, who said “this better not be a joke, you ain’t gonna steal nothing right?” and so she went back, screaming and came running out. An Ambulance came and the guy ended up being ok eventually. Nothing like that has ever happened to me at Boarders. I like perusing the actual bookstore. I’m a visual person; I have to have the book in front of me, read it a little, etc. before I buy it. I can’t think of a Waldens/Borders Express that’ll still be LEFT in the state. In NJ, I remember when Borders opened their superstore (one of the first in the area) in East Brunswick. It was the first store with a cafe and would eventually expand to having a music dept. They were also open until 11PM (most superstores now are only open until 11 on weekends, as a result of the economy) and on any given night of the week, one would see the Borders end of the MidState Mall parking lot to be mobbed. These bookstores eventually brought in a community relations person and with the coordinating of events, it made an additional reason to go to the local bookstore, expanding from stopping to buy a book, browse, have coffee, etc. Once Borders and B&N started to pop up all over NJ, it led to the death of the smaller mall bookstore. Some independents in NJ still exist and they do so because of their local charm, loyal customer base, author events (better than BN and Borders in many cases) and atmosphere (Bookends in Ridgewood SMELLS like an old bookstore). 🙁 Man! They are closing my mall’s Borders Express! How dare they? Some of us still like to read! At least the nearest mall with Waldenbooks is also losing theirs, had that one store been left open and the one in my mall closed I’d be insulted! I just checked the website Borders came up for the Waldenbooks store closures and it seems Wakefield Mall’s Waldenbooks is safe, for some reason they are closing the Warwick Mall Waldenbooks but leaving this small store safe! How weird, I thought it’d be other way around. Is there a Borders very close to that location? I know that any Waldenbooks that was in a mall within a certain distance of an existing or new Borders store (I forget the distance at the moment) was closed. We had a Waldens in our local mall (Chicago burbs) that closed within a year of a Borders going up across the street from the mall. I can’t think of many instances locally of a Waldenbooks surviving with a Borders within a mile or so of it (the Waldens at Fox Valley in Aurora is an exception, but it seems to be on the closing list). @Doug, They did open a Barnes and Noble in the periphery of my local mall, maybe that’s what did them in, although the other mall with Waldens, i don’t know if there’s a B&N or even a borders nearby. A few years ago, there was a full-sized Borders sans cafe and music at The Mall at Short Hills. It closed around 2006/07. Short Hills will now have a Borders Express (where the old Met Museum store was), which is going against the trend…don’t know if it’s just for the holidays or permanently. I was always surprised that Short Hills didn’t have a full-sized Borders or B&N…the only reason they wouldn’t is probably because of space issues. @mallguy, Borders closed the Waldenbooks in the White plains Galleria along time ago & closed it’s flagship store at the White Plains pavillion in January 2008. In the latter case demagraffic shifts were sighted for the stores closure. However Barns & Noble opened a location in the heart of the downtown area & is thriving. In the Pittsburgh area, the stores closing are at Century III, Washington and Uniontown malls. While C3 and Washington Crown’s closing is understandable, I don’t understand why they would close the Uniontown store, since I don’t believe there’s a Barnes and Noble or Borders nearby. Also, the Westmoreland Mall has a HUGE Borders Express store downstairs, which at one time was a prototype for Waldenbooks. I remember when it first opened, it had a tube climbing thing that kids could crawl through. @Gary, the Fashion Square Mall Waldenbooks was like that too. It was a Waldenbooks/Waldenkids combo. Both Troy and Livonia once had standalone Waldenbooks; one was “Waldenbooks & More” and one was “Waldenbooks Superstore,” with an “& More” in Lincoln Park too (I think). I had been to both and couldn’t tell the diff between the two. The name of B.Dalton derives from “Dayton” of the Dayton-Hudson/Target company. At one time WaldenBooks operated the book department in Kmart. @Bob, Not quite. Dayton Hudson always claimed that the name B. Dalton had no meaning at all. It was chosen simply because it sounded classy. Waldenbooks was OWNED by Kmart in a very ill-advised business move. Waldenbooks was begun by Carter Hawley Hale stores, sold to Kmart, then was spun off. Soon after, they purchased Borders which had a handful of superstores. My local mall used to have both a Waldenbooks and a B. Dalton. The B. Dalton store was much larger and nicer then the Waldenbooks, but it closed about ten years ago. Waldenbooks is still around though, and does very good business. The closest Borders or Barnes & Noble stores are over 50 miles away, so that probably explains why it’s done better than most. Just so you folks know, Borders in the UK has now gone into administration, accompanied by the closure of most of its Borders and Books Etc (discount chain) stores. They’re keeping the remaining ones open in hope of a buyer. The closest Borders to the Alpena Mall Walden’s? Way the heck down in Flint. 150 miles away. i dunno is it’s related to the topic, but FYE is closing a LOT of their stores, they are closing the FYE at my local mall alongside their Saturday Matinee store and a nearby freestanding FYE in a nearby city, i asked the clerk at FYE why were they closing and she said that the company was going out of business, is this true? Does anyone know? “fye” going out of business wouldn’t surprise me. Their selection isn’t as good (and deep) as it used to be in a lot of their stores and their prices are higher than getting CDs through other channels. When Suncoast stores went out, they moved the DVDs into fye and took away some of the CD selection. I notice the CD selections getting downsized more and more and it’s a big turnoff. I’m forced to buy most CDs online now since I’m a collector and tend to want more obscure, harder to find things, which “fye” doesn’t stock most of the time. I’m often appalled at what CDs I see by certain artists. Instead of the more preferred compilations for some of the older artists, they stock the less desirable ones from no-name labels instead of the finer, more well-researched ones. The company desperately needs to do more research on what they stock. The Suncoast store here at Westmoreland Mall near Pittsburgh is closing down, I think it’s one of the last remaining Suncoast stores still around, since the only other Pennsylvania store is in Harrisburg. There FYE store is still open, for now at least. It wouldn’t surprise me if the entire FYE chain goes under in the near future, they have to compete with Walmart and Best Buy, which offer better selection and lower prices. @Gary, Not to forget online alternatives either. I used to frequent many area Suncoast, Musicland/Sam Goody/FYE stores and one large Media Play location before they all flipped to the FYE banner, mainly due to my anime hobby. Speaking just for that hobby alone, it’s all now gone to online catalogs and larger Best Buy stores exclusively (after they purged the category and other niche categories in small stores like my local one from their DVD section to focus more emphasis on BluRay disc selection). It’s already a niche market among many niche entertainment options, which have all been dealt a blow by online stores which have a wider breadth of selection and, for me, It requires no trip to a large city. Stinks, but that’s the way the retail segments are rolling. Mall-based music and books really didn’t proliferate and peak until the late 1970s and especially in the 1980s when it wasn’t a surprise to find within a 150+ store mall, two or three bookstores, and 3-4 music/entertainment stores, all due to them being under different chains. That Wakefield Mall sign is gone, too. I visited in July and it broke my heart a little! @stacy, what did they change it to?! @Caldor, it was just a plain beige front, IIRC. Looked like they took the sign down and painted over any scar. Very sad. I believe they had put “Wakefield Mall” on the glass above the front doors, in white. The W and M were stylized a little bit, but nothing like the old sign. I took pictures, but lost them in a hard drive crash. I’m going back for Christmas and hopefully will have a chance to spin by. Speaking of FYE(not to mention I first heard of the new round of closings from a friend who frequents one of their locations more often than me that is about to close), I stopped by one of the closing FYEs a few days ago, and learned that 4 were closing in the Chicago area, including 2 mall locations: Harlem-Irving Plaza and Ford City. The other 2 are standalone stores, and were rebranded from Coconuts within the last 2 years: Lake and Harlem(River Forest) and 95th St.(Oak Lawn). While I like FYE since I once in a while will find a good buy for used products(before Trans World began selling used products in FYE stores, I refused to shop at them), I would not be surprised if that chain goes under in the next few years, if not next year. Other people have summed up the points enough about why FYE is shedding stores, that I have no need to repeat those(and my theory) here. The amount of Blockbuster and Hollywood Video stores remaining in the Chicago area has surprisingly gotten pretty scarce, and I constantly am amazed to see a Hollywood location hang on as long as it has. As for this particular Hollywood location, I also partially think it’s b/c of 2 factors: little video rental competition in the immediate vicinity, and the sales at their attached GameCrazy store are likely higher than average, due to the fact that there are almost no GameStops in close range, and that the closest one is 11/2 miles away. There used to be a 2nd Hollywood Video south of me that closed several years back, as well. ….as for what I said for Circuit CIty, that is despite how much I did like shopping there. I’ve always wandered about H.H. Gregg, since I’ve seen them all over Indiana(but’ve never made it to one of their stores), and later read up that they started in that state too. I was in Valley River Center in Eugene, Oregon last summer and they still had a Waldenbooks that looked like it had zero remodeling done since I last saw it circa 1993. It also looked like it had the same employees! The mall also still had a Suncoast Motion Picture Company that looked exactly the same. There can’t be many of those around anymore!